High school Brigade members get ready to audition for Centex. 1A, 2A, and 3A middle and high schools in the Central Texas Region came together to audition for a chance to play in the Centex Honor Band last week. The Bison Brigade participated in the competition and had some good results, with six high school and two junior high members earning spots. For the high school Centex audition, students have to learn two pieces of music before the blind audition. The songs are cut into sections and the students are told which section they will play the day of the competition. After this portion of the competition, the students then have to play a “sight piece”. A “sight piece” is sheet music that the students are given 30 seconds to look at and play to the best of their ability. The judges then select the top performers and those students are given the chance to play in the Honor Band. Those that make it into the Honor Band are given music that the rehearse with directors and a great conductor/clinician for a professionally recorded concert. Senior Megan Wedhorn made fifth chair concert band on clarinet and first chair symphonic band on Bass Clarinet and Sanchez made fourth chair symphonic band. 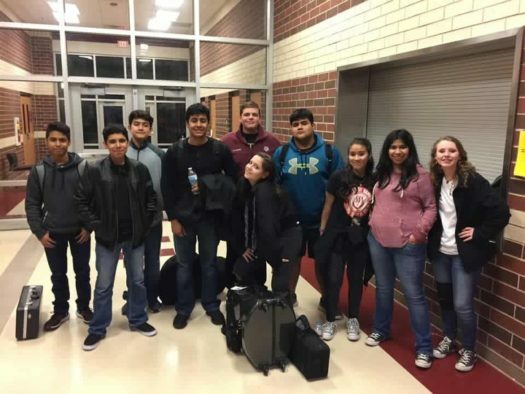 Other students who made the Honor Band include Almeida who made ninth chair concert band, junior Ernesto Dominguez made seventh chair concert band, and freshman Luis Carrillo made seventh chair symphonic band. This year’s Bison Brigade had the most students audition for the Honor Band and make it on to the short list of selected participants. The students will perform in the CENTEX Honor Band in the coming weeks. Until then, the students will be practicing for their professional recording of the concert.